Hi, I'm Ash. 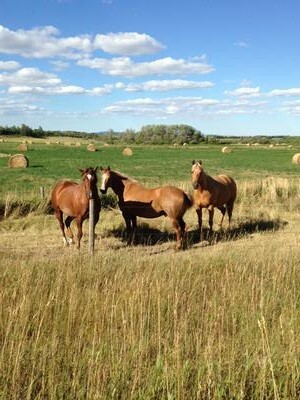 I'm a mustang and live in Montana where I am with my herd and my mother. I'm a foal. One day, I'm laying in the grass when I hear a rumbling. It gets louder and louder until my mothers yells "Run, run! Follow me!" They all run away and I try to get up in a hurry but because of that I stumble and fall to the ground. I watch as my herd frantically races to safety. Then I see it, Cowboys! I get up and look around frantically for a hiding place. I run to a dead shrub and watch as they race past chasing my family, my mother, my friends! A tear rolls down my cheek as a cowboy turns around and notices me! I run my heart out but I knew I couldn't outrun an adult stallion so I feel a hard rope around my neck and I struggle to get out of it's harsh grip. "Gotcha," says the cowboy, "where's your momma, little guy? We'll find her and catch her." But I was not listening. I was still rearing and bucking. I wanted my momma! As the Cowboy gallops away, I follow and we get to my herd where other cowboys are trying to catch everyone. I see my momma! "Guys get that mare! She's this little one's dam!" So he tries to catch her and she rears up to his stallion. "Give me my baby!" She whinnies furiously. "No can do, sorry baby," he says as he grins mischievously to her. "Don't you call me that!" And the rope slides around her neck. "Got her! Let's go guys!" The cowboy says. "Ash! I'm so sorry I left you I was in a hurry and I couldn't find you!" She says as she nuzzles me. "It's okay but we need to get out!" "No use baby. Too hard but I'll try." As she rears up, I buck and pull. "Woah, there girl," he says and pulls us away. A few minutes later we arrive at a strange thing that my mother calls a trailer. Wow! I loved this story!!! I wish it was longer!!!! I've been looking for a website to talk with other horse crazy girls like me for a long time. I love this site! Anyways TTYL? When they put us in the stall they had the stallion beside us my mother kicked at the walls and I did too "mama will we ever be free again?" I ask sadly and she sighs "I don't know Ash but I hope so" she answers sadly. In the evening the woman comes to our stall and opens it causing my mother to rear "woah girl it's okay" she says and runs pass her. She opens a door and there's a small paddock. "There you go girl" she says and runs out. My mother sniffs it and walks outside slowly with me following. Then she sees the stallion next to us in the other paddock and she keeps me away from him because he gets close to our fence. Then my mother has an idea in the night to jump the fence but she's worried I can't jump it "I can mama I'm not a newborn" I say "we'll see" she answers nervously. That night we jump the fence and I hit the fence and fall down. "Are you alright?!" my mother exclaims yes! "I answer annoyed" then let's go" she says and gallops off with me following. We gallop into the night and in the morning we've reached our home and I'm so exhausted, I collapse on the dirt ground and my mother panics Ash Ash! "Are you alright Ash?!" I don't reply because I'm too tired hungry and thirsty. Then I whisper "I'm so tired and hungry and thirsty" I move a little bit and then we hear a twig snap from the bunch of trees near us. "Who's there?!" Asks my mother and out comes a handsome buckskin stallion. "Who are you?! My mother exclaims. "Why hello I'm storm and you are?" Sahara answers my mother and they touch noses. Do you belong to another stallion? He asks and they grin playfully. No, why do you ask? You will be my mare he says playfully. Okay, and this is my colt Ash, she introduces me. Are you alright? He asks and sniffs me. "Food" I whisper weakly and my mother nudges me to get up and I weakly do and nurse. SAHARA'S POV- a long time after ash grows up and I'm pregnant with another foal. I graze with storm when suddenly a man with a bike walks over to us and storm charges at him "what a beauty he says to me and storm charges him but the man runs away." Thank you storm I say and we nuzzle. THAT IS THE END OF.... DIARY OF A HORSE! Don't forget to tell me what you think about diary of a horse in the comments! Hope you liked it and happy riding! Sorry guys I need to edit part 2 I did it but then it glitched and I lost it so I had to do it again. Ugh, so annoying but anyways sorry about that! The cowboy dismounts his horse and leads him into the trailer, still holding the rope he ties him to it. After forcing us into the trailer and tying us to it we bang on the walls and whinny until the trailer stops and a door bangs shut. He leads us out and before us is a stable with paddocks and horses in them and a human house at the side. Then the door opens to the house and a woman with tan riding pants(breeches) and a t-shirt comes out "got some horses Howard huh?" "yup" he replies and my mother neighs "let us go!" "Yeah!" I rear and she bucks. "The other men are coming" he says and right then the other trucks come and the other men lead out the other members of our herd. Then a young human girl with short brown hair and a purple short and tan riding pants(breeches) comes running out of the house "yay the horses!" "I like that one!" She says pointing to me Kathy!" "Do not run or yell in the stables!" "I know though the horses are very pretty let's lead them to the stables" she says and they drag us to these boxes in the stables that my mother calls 'stalls' part 3 coming! Thanks Sydney, you're really nice and I love your name! Do you ride? I go in riding lessons at Blarney Stone farms! I'll be sure to write more and Happy Valentine's Day!